All songs composed by Lennon/McCartney except where indicated. © 1967 Original Sound Recording Made By EMI Records, Ltd.
© 1987 EMI Records Ltd.
Sgt. Pepper’s Lonely Hearts Club band didn’t start out life as a “concept album” but it very soon developed a life of its own. I remember it warmly, as both a tremendous challenge and a higly rewarding experience. For me, it was the most innovative, imaginative and trend-setting record of its time. “The Beatles definitely had an eternal curiosity for doing something different,” says George Martin, producer of Sgt. Pepper’s Lonely Hearts Club Band. Cerainly this album was entirely different to anything which had gone before, and although it has been much imitated since, it remains today a unique, epochal record one which revolutionized the entire recording industry and caused such vast repercussions that its influence will very probably be felt for as long as music is written and performed. The Beatles’ musical ideas progressed in a most tangible way with each album they recorded. Geoff Emerick, the recording engineer who with George Martin formed the imaginative team which translated the Beatles’ requirements onto tape, once totted up the number of hours put into the making of Sgt. Pepper and came up with 700. Please Please Me, the Beatles’ first album, was recorded in 585 minutes. The very end of the album typifies the advanced studio trickery applied throughout Sgt. Pepper. After the last droplets of the crashing piano chord of ‘A Day In The Life’ have evaporated, come a few second of 15 kilocycle tone, put there – especially to annoy your dog – at the request of John Lennon. Then, as the coup de grace, there is a few seconds of nonsense Beatle chatter, taped, cut into several pieces and stuck back together at random so that, as George Martin says, purchasers of the vinyl album who did not have an auto return on their record player would say “What the hell’s that?” and find the curious noise going on and on ad infinitum in the concentric run-out groove. Sgt. Pepper’s Lonely Hearts Club Band must be nothing less than the most important and revealing compact disc release there can ever be. “When I’m Sixty-Four” – Recording commenced in studio two at Abbey Road on December 6, 1966. Album version mixed from take four. Writer: Paul. Lead Vocal: Paul. Producer: George Martin. Recording Engineer: Geoff Emerick. Second Engineer: Phil McDonald. “A Day In The Life” – Recording commenced in studio two at Abbey Road on January 19, 1967. Working title “In The Life Of…” Album version mixed from takes six and seven. Writers: John with Paul. Lead vocal: John, with Paul. Producer: George Martin. Recording Engineer: Geoff Emerick. Second Engineers: Richard Lush, Phil McDonald. “Being For The Benefit of Mr. Kite” – Recording commenced in studio two at Abbey Road on February 17, 1967. Album version mixed from take nine. Writer: John. Lead vocal: John. Producer: George Martin. Recording Engineer: Geoff Emerick. Second Engineers: Richard Lush. “Fixing a Hole” – Recording commenced in Regent Sound Studio, Tottemham Court Road, London, on February 21, 1967, and later completed at Abbey Road. Album version mixed from take three. Writer: Paul. Lead vocal: Paul. Producer: George Martin. Recording Engineer: Adrian Ibbetson (Regent Sound), Geoff Emerick (Abbey Road). Second Engineer: Richard Lush. “Getting Better” – Recording commenced in studio two at Abbey Road on March 9, 1967. Album version mixed from take fifteen. Writer: Paul. Lead Vocal: Paul. Producer: George Martin. Recording Engineers: Malcolm Addey, Ken Townsend, Geoff Emerick, Peter Vince. Second Engineers: Graham Kirkby, Richard Lush, Keith Slaughter. “She’s Leaving Home” – Recording commenced in studio two at Abbey Road on March 17, 1967. Album version mixed from take nine. Writer: Paul. Lead vocal: Paul. Producer: George Martin. Score: Mike Leander. Recording Engineer: Geoff Emerick. Second Engineers: Richard Lush, Keith Slaughter. “Sgt. Pepper’s Lonely Hearts Club Band (Reprise)” – Recording commenced in studio one at Abbey Road on April 1, 1967. Album version mixed from take nine. Writer: John. Lead vocal: John, Paul and George. Producer: George Martin. Recording Engineer: Geoff Emerick. Second Engineer: Richard Lush. Three other songs were recorded during the session. 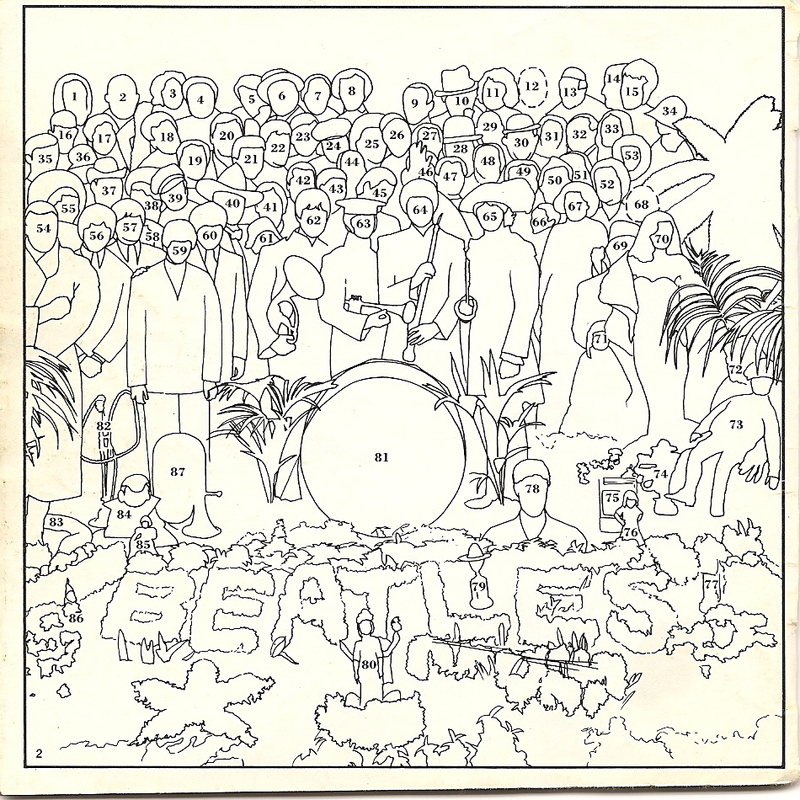 The first were taken for release as a single, the third didn’t surface until the Yellow Submarine film soundtrack album. “Strawberry Fields Forever” – Recording commenced in studio two at Abbey Road on December 29, 1966. “Penny Lane” – Recording commenced in studio two at Abbey Road on December 29, 1966. “It’s Only A Northern Song” – Recording commenced in studio two in Abbey Road on February 13, 1967. By suitably programming your compact disc hardware you’ll be able to hear the album as it was originally intended. Extracted from The Beatles at Abbey Road, to be published late-1987. I asked them to make lists of people they’d most like to have in the audience at this imaginary concert. John’s was interesting because it included Jesus and Ghandi and, more cynically, Hitler. But this was just a few months after the US furor about his “Jesus” statement, so they were left out. George’s list was all gurus. Ringo said, “Whatever the others say is fine with me,” because he really didn’t want to be bothered. Robert Fraser and I also made lists. We then got all the photographs together and had life-sized cut-outs made onto headboard. Robert Fraser was a business partner of Michael Cooper, an excellent photographer, so he was commissioned to do the shoot. I worked in his studio for a fortnight constructing the collage, fixing the top row to the back wall and putting the next about six inches in front and so on, so that we got a tiered effect. Then we put in the palm tree and the other little objects. 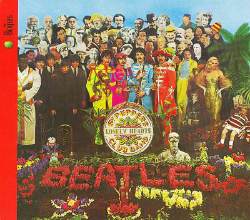 I wanted to have the waxworks of the Beatles because I thought that they might be looking at St. Pepper’s band too. The boy who delivered the floral display asked if he could contribute by making a guitar out of hyacinths, and the little girl wearing the ‘Welcome the Rolling Stones, Good Guys’ sweatshirt was a cloth figure of Shirley Temple, the shirt coming from Michael Cooper’s young son, Adam. The Beatles arrived during the evening of March 30. We had a drink, they got dressed and we did the session. It took about three hours in all, including the shots for the centre-fold out and back cover. I’m not sure how much it all cost. One reads exaggerated figures. I think Robert Fraser was paid 1500 pounds by EMI, and I got about 200. People say to me, “You must have made a lot of money on it,” but I didn’t because Robert signed away the copyright. But it has never mattered too much because it was such a wonderful thing to have done. This album sleeve was the first to feature printed lyrics and it was one of the first to have a gatefold sleeve. It was also the first to have anything other than a plain inner bag too, the first pressing coming in a slightly psychedelic sleeve designed by Simon and Marijke of the Fool. And we also had a card with the cut-outs, which I had originally intended to be a small packed with badges and pencils and such like. That was stopped because it would have caused EMI big marketing problems. This is a stereo recording. Black and White Photography courtesy of the Michael Cooper Collection.